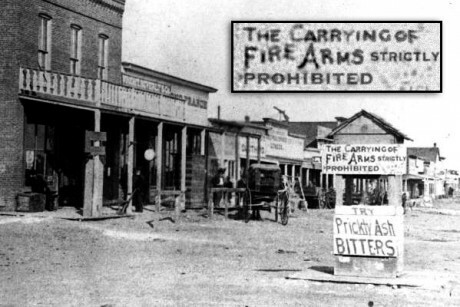 Sign banning the carrying of firearms in Dodge City, KS in 1878. The political debate over gun rights and regulation in the United States is often driven by contemporary events: school shootings, mass shootings, and marches dominate the headlines, and for good reason. They raise pressing questions about what law can or should do to stem the bloodshed going forward. But the presentism of the gun debate shouldn’t hide the fact that judgments about the balance of gun rights and regulation are as old as the republic itself. Laws imposing storage requirements trace their lineage all the way back to England. Today’s headlines focus on “assault weapons” and high-capacity magazines, but prohibitions on dangerous or unusual weapons in England came over to the colonies from the very beginning. Guns in schools have been the subject of regulation for more than a century (including in places like Texas, Oklahoma, and Mississippi). These examples, and hundreds of others, are now freely available in the Duke Repository of Historical Gun Laws, a searchable database of gun laws from the medieval age to the middle of the twentieth century. The Repository went “live” in 2017, at a time of increasing interest in historical research on gun laws. Historians and political scientists in particular have done extraordinary work in excavating the practice and understanding of gun rights and regulation throughout United States history. From our perspective as history-interested law professors, this is a wonderful development. Constitutional lawyers have a great deal to learn from constitutional historians in general, and from historians of gun laws in particular. In part, courts themselves are driving demand. In the 2008 case District of Columbia v. Heller, the Supreme Court held for the first time that the Second Amendment is not limited to service in the organized militia, but protects an “individual” right to keep and bear arms for private purposes like self-defense against criminals. That holding represented a sea change in the law, and has led to more than 1,000 Second Amendment cases in the years since. From the historical research perspective, what makes Hellerand its progeny so interesting is not just the result, but the methodology that the Court employed: A search for the original public meaning of the Second Amendment, which it then translated into legal doctrine. Four dissenting Justices, applying the same methodology, read the history as supporting the militia-based view. In reaching that conclusion, the Court cited more secondary materials—including historical scholarship—and cited them more often, than it did all traditional legal materials (statutes, cases, and the like) combined. In the ten years since Heller, many lower courtshave taken a similar approach, looking to whether particular laws are “longstanding” and therefore presumptively constitutional. In short, there is a serious demand for informed historical scholarship on gun rights and regulation, and an eager audience both inside and outside the academy. Judges and lawyers want help from scholars. One struggle, however, has been in making the historical evidence accessible. The sources can be hard to find, and time-pressed lawyers aren’t in a good position to do major historical surveys about particular kinds of gun regulations—or, worse, they’re apt to do it poorly. That’s where the Repository comes in. Though it is impossible to be comprehensive, the Repository contains the text of more than 1,000 statutes primarily drawn from records in the HeinOnline Session Laws Library, and the Making of Modern Law Primary Sources Database. Other sources included Yale Law School’s Avalon Project as well as session laws digitized through state archives, archive.org, the HeinOnline State Statutes Historical Archive and Google Books. The Repository can be searched in many different ways, including by text, by topic, by jurisdiction, and by year—or some combination thereof. For ease of analysis, the sources are also divided into five historical periods: (1) English, which includes English statutes up to the split with the American colonies in 1776; (2) Colonial, which includes statutes passed within the American colonies beginning in 1607 and continuing to the ratification of the Constitution in 1791; (3) Pre-14thAmendment; (4) Post-14thAmendment; and (5) Twentieth Century up to 1934, the year of the first major federal firearms regulation, the National Firearms Act. Of course, the Repository is only a tool, and responsible historical research should use it as a starting point. For example, the Repository only contains statutory text. How were the laws enforced? By whom? Against whom? Where they later repealed, or overridden by constitutional amendments? Those questions, and countless others, should now be much easier for professors and students ,judges and lawyers, to ask and answer. Our hope is that the Repository helps to encourage a deeper and more engaged historical analysis of gun laws in the United States, and we welcome corrections, comments, and questions at gunlaws@law.duke.edu. Joseph Blocher is Professor of Law at Duke University School of Law and Darrell A. H. Miller is Melvin G. Shimm Professor of Law at Duke University School of Law.